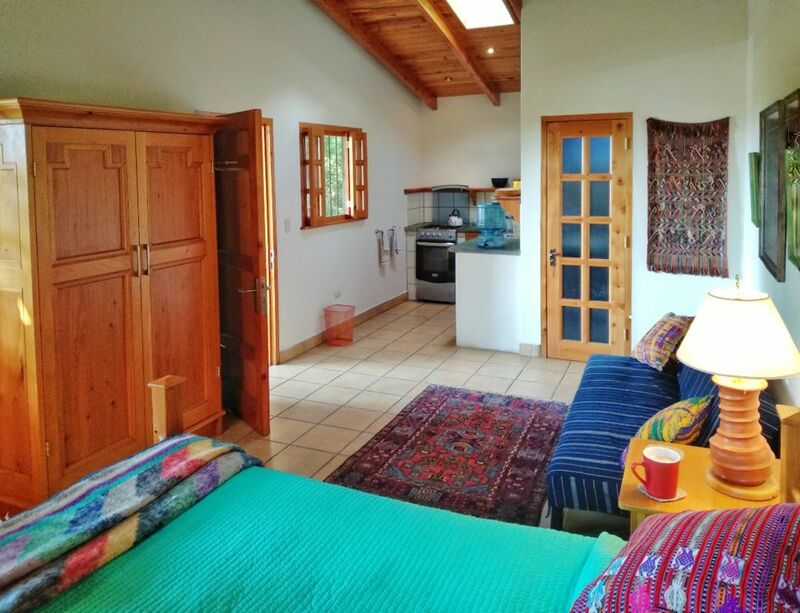 This private, secure, and comfortable second level apartment has a small kitchen with stove/oven and refrigrator, its own covered porch, and a wonderful view of Lake Atitlan and 7, including some live, volcanos. The short 5 minute walk to town makes it easy for shopping, activities, and restaurants, but far enough for quiet nights. The wood furniture for this apartment was hand built by me, having been a cabinetmaker in the states for 25 years. The queen orthopedic pillow top bed is provided with 100% cotton sheets, and the bathroom, with 24 hour hot water from a brass rain shower head, sufficient towels, and complimentary shampoo and soap for stays less than a week. The sofa converts to an extra bed for a child or third person. The apartment is located inside a secure walled garden and has wifi internet access and use of the washing machine. There's a wonderful private garden to enjoy and often other guests staying with me in the house, or the other apartment, from all destinations, to chat and exchange information with. We can meet you at the public dock, or at Blind Lemon's Restaurant in the central area of San Marcos to help you with your luggage, or even arrange transportation from the airport in Guatemala City if you like. I am an acoustic blues musician, who passionately loves pre war country blues. Although I was born and raised and educated in Pennsylvania, I have lived on Lake Atitlan, in San Marcos La Laguna, Solola, Guatemala for twenty years and am married to Catarina, a Maya woman born here on the shores of this lake. I love the Guatemalan people and culture, and also have a restaurant here, called Blind Lemon's which features good food and treating guests to some live blues. I also occasionally have acoustic blues guitar workshops here and also have private students.I have two beautiful guest apartments here in San Marcos that have great views of the lake and it´s volcanos. I have built these with local workers who have been with me for years, and I have done the woodwork and built a lot of the furniture, as I worked for years in the states as a cabinetmaker. I feel that my wonderful quiet, secure, and beautiful compound here is much more enjoyable when I can share it with guests. I bought this property in 1995 and started building my house, which is in the same compound as the guest apartments in 1999. I love the location for the wonderful views, and for being a little apart from the noise and activity of the town. It is very natural and peaceful and loaded with tropical plants and birds. The unique benefits of staying here is that you have a secure, peaceful, and quiet place to relax and enjoy and to explore from. Also my experience living here and with my Mayan family can give you some unique and interesting guidance to discovering and enjoying the culture and environment. Just outside the quiet small town of San Marcos La Laguna, but only a 5 minute walk to stores and restaurants. Traditional Maya village. People pass daily who work in the mountain fields and women pass with firewood for cooking. View of Lake Atitlan and 7 volcanos. From the property there are mountain views in the opposite direction of the lake. What a great place to stay. Carlos is fun to talk to and very helpful. We could contact him easy. The apartment is very nice, clean and safe. We would stay there again. We had a wonderful stay in this quality well made apartment. Ludwin took care of everything we needed because Carlos was away. The yard is gorgeous and the view from the balcony or the bed, will make you at peace. They make easy for you to compost and recycle, which is a great plus to us. The apartment is 5 minutes away from anything. We could buy everything we needed from locals and even find places to eat with locals. I had a thoroughly lovely time staying in Carlos' place. The apartment and furnishings are really nice quality and it is a really nice place to hang out and read/relax. Waking up with the view of the volcanoes from the window and bird song in the forest around the house was a dream. The location was great - close enough to the village that you can pop back and forth, but set back in the woods so you can feel in your own little world. Perfect for getting away from it all. Carlos is a great host and the place is nice and secure so it is ideal if you are travelling alone and want a base to feel at home in. There is a house being built on the plot in front of this one, which is in view from the balcony but doesn't obstruct the view of the volcanoes. I did have a sinking feeling when the workers arrived and put on their music on my first morning. But I mentioned it to Carlos who had a chat with them and they agreed to switch it off for the days I was there, which they did and then everything returned back to peaceful birdsong. Otherwise the construction was very quiet while I was there. Overall, I'm very happy and can't wait to come back again in the future! I will be recommending this apartment to friends and family. Magical! Carlos was the perfect host..there when you needed questions answered or supplies, but otherwise not invasive! His apartment is the ideal perch! AND his blues guitar at his restaurant, The Blind Lemon was soothing to the soul! THANK-YOU Carlos and Kata and Son!! And thanks to you! It was a pleasure to have you both. My cousin and I stayed for three nights, we had the top and bottom apartments. Units were as pictured, very comfortable, clean and had everything we needed. Carlos was very accommodating and great to do business with! I do recommend ear plugs for the dogs and roosters in San Marcos! Sunrise is beautiful from the top balcony! Great views of the lake and the climate is an eternal Springtime . Saw one of the volcano mildly erupt one morning as I was waiting for the the sunrise. The plume was illuminated by the rising sun. Room is clean, bright, airy and the water pressure is good in the shower. If you arrive via the small ferry let Carlos know in advance of the ETA and if you come via the road check-in at the Blind Lemon Restaurant- which also has cable for sporting events. Carry-on wheeled bags and backpacks work best on the path up to the house. Good restaurants with a healthy food /lifestyle theme are in San Marcos. Short ferry ride to San Pedro and a little longer to Pana for day trips. Probably the main attraction besides the beauty of the lake is the friendly indigenous Maya people, especially the women with their traditional colorful dress.